Some people hate runny eggs. I don’t. I love them, especially when they are prepared simply as “oeufs à la coque“. Perhaps because this takes me back to the time when, as a kid, my mum used to prepare soft boiled eggs. Like many children, my brother and I particularly loved the part when we could dip our mouillettes* into the eggs. Succulent! *a mouillette [pronounced moo-YEAH-t] is a buttered small, long and slim stick of baguette bread, or any other type of bread, that is dipped into the egg; from the French verb “mouiller, se” which means to get wet. “Oeufs à la coque ? We call them egg and soldiers in my family in Ireland,” P. told me when, many years ago, I asked him whether he had eaten them before. He looked back at me. P. is often confused between remembering the foods he learned to eat living in Ireland or the States. “An egg en cocotte is the cousin of the oeuf à la coque,” I replied. At least in my own interpretation. You probably know that in French, a cocotte is an oval or round casserole with a lid and two hand grips on each side used for stewing or boiling. The reason why we call this egg dish an “oeuf en cocotte” is because the eggs — gently broken in the cup — are cooked in a small cocotte; nowadays a glass or ceramic ramekin is more often used. But I still prefer to use glass because I like the idea to see the food. You can pretty much put anything that you like in un oeuf en cocotte; the different ingredients added are then called l’appareil. Crème fraîche or crème liquide (heavy cream) is often used, as well as fresh herbs. In my first oeufs en cocotte batch, I decided to add tarragon — because anything tarragon is always welcomed in my kitchen, remember? — chives, leek and smoked salmon. The second one included sautéed chanterelles, because it is the season, n’est-ce pas ? Served as an appetizer, this dish is easy and quick to prepare, fifteen minutes total, not more. This will even give you plenty of time to take a walk to the park before your meal, just as I did when I tested the recipe one evening, last week. 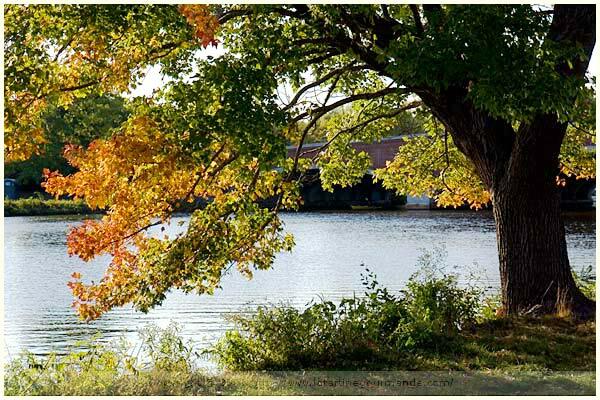 This time of year has to be one of my favorites in New England, when I am able to observe the change of colors in nature and trees. I have never seen anything like this anywhere else before. Antoine de Saint Exupéry wrote “Dessine-moi un mouton” in his marvelous famous novel, Le Petit Prince. I could change his words to “Dessine moi un arbre“, to illustrate my fascination with trees. Aren’t they quite something? And oh, did I mention this before? Renewing with my many years spent as a teacher of French as a second language, I was pleased to teach my first atelier cuisine/français (cooking/French workshop) at the French Library Alliance Française in Boston this past Friday. The theme? La cuisine réconfortante (Comfort food). This eggs en cocotte recipe was part of the menu. And now that I am looking at it more closely, perhaps I should have entitled the class “La cuisine sur le thème du jaune” (Cooking in Yellow). The next class is happening on November 13, with a theme around Verrines & Mignardises. Take a look if you are interested. 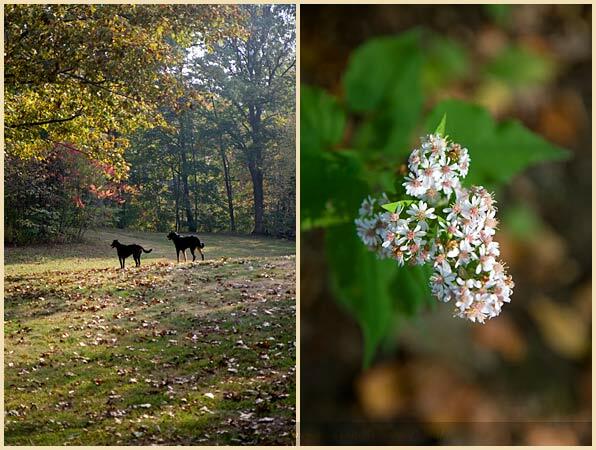 In the meantime, enjoy the eggs, and the beauty of fall, as long as it lasts! Yesterday, it was 75 F in Boston (23 C). Today, we will reach 80 F (27 C). C’est incroyable ce temps ! A bit scary actually! The recipe of the apple flognarde will follow soon. Slice the leek finely, white and pale green parts only. In a non stick frying pan, heat 2 Tbsp olive oil. Cook the leek on medium to low heat for a few min so that it softens, but never gets brown. Season with salt and pepper; set aside. Take 4 ramekins and add 1/2 Tbsp of crème fraîche* to coat the bottom. Add the salmon and some herbs. Add the leek and more chopped herbs. Break gently one egg per ramekin. Season with salt and pepper. Add a little more herbs and creme on top of the egg white, leaving the yellow intact. Place the ramekins in a pot filled with boiling water so that the water line reaches half of the height of the ramekins. Cook for about 10 min, until the egg white is set as you like. *You can also heat the cream slightly so that it is easier to spread. Émincez la partie blanche et vert pâle du poireau finement. Dans une poêle anti-adhésive, faites chauffer 2 càs d’huile d’olive. Faites-y suer le poireau sur feu doux à moyeb pendant quelques minutes. Détaillez le saumon en petits dés, ou petites lanières. Prenez 4 ramequins et déposez une demie cuiller à soupe de crème pour recouvrir le fond. Recouvrez de saumon, puis d’un peu de mélange d’herbes. Ajoutez le poireau puis à nouveau un peu du mélange d’herbes hachées. Cassez délicatement un oeuf dans chaque ramequin. Salez et poivrez. Ajoutez encore un peu d’herbes, du sel et du poivre, et finissez par un peu de crème ajoutée sur le blanc d’oeuf, en évitant d’en mettre sur le jaune. Placez les ramequins dans une casserole remplie d’eau à mi-hauteur. Faites cuire dans ce bain-marie pendant 10 min environ, jusqu’à la texture du blanc d’oeuf souhaitée. Servez avec des mouillettes de pain tartinées de beurre. * Vous pouvez aussi chauffer un peu la crème pour qu’elle ait une consistance un peu plus liquide. Les eoufs encore coulants, je ne peux pas, meme si les cocottes sont belles. Par contre les feuilles d’automne, vues par toi, on les mangerait presque. Je n’ai pas eu le temps de passer ces derniers temps, mais j’ai beaucoup aime tes photos si poetiques de Paris. A chaque fois tu me fais regarder ma ville d’un autre oeil. I know what eggs and soliders are and I’m not Irish, though I believe the name did originate in the British Isles. I used to hate runny eggs but I’ve recently developed a liking for them. Still, my girlfriend thinks they’re disgusting so I don’t make them very often. Yours look delicious so maybe I can use them to lure her over to the runny-egg-lovers club. 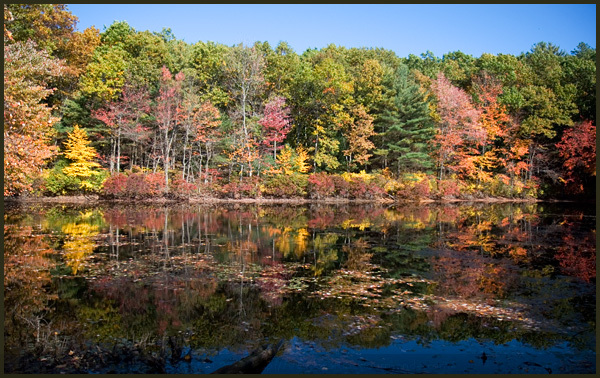 Also, your Autumn pictures are beautiful! I wish it looked like that here! 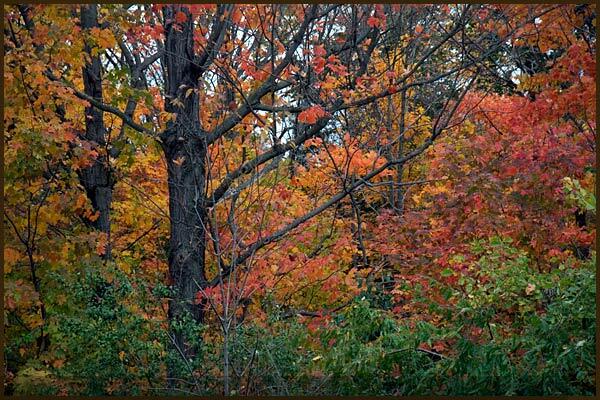 the autumn foliage is beautiful, I think it will be a while longer before we can see them here. Oh, lovely. I’m with you – I really adore runny eggs. I hate cooked, solid yolks, but runny yolks are the best sauce for almost any food, as far as I’m concerned. My partner won’t eat them, but the glory of eggs is that each can be cooked differently to suit our varying tastes. this is too lovely! I like my eggs runny too! Je suis fan des oeufs en cocotte alors je me garde ta recette pour la prochaine envie…et la ballade m’a beaucoup plu ! i wish my sweetie liked eggs. i’d make that dish! 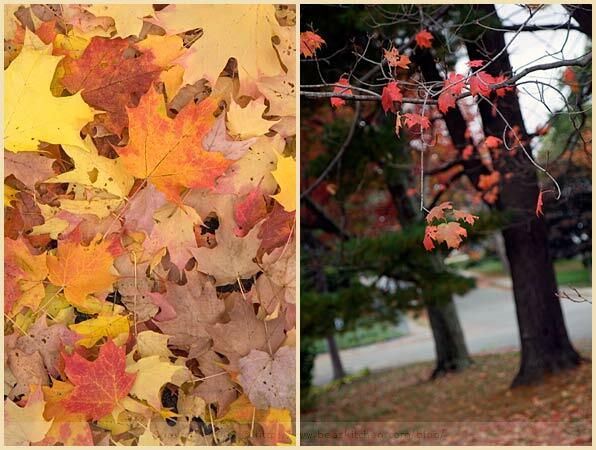 I love your autumnal pictures! Really soul uplifting! Love those little glass cups for the eggs. and I sure love the runny egg eating!! We finally have our first fall day in Dallas and I’m really enjoying the fire in the fireplace and the bean soup on the stove top! Fabulous photo of the trees and the colors! Yes, I really enjoy this time. These eggs do bring back childhood memories as my mother would make “soft-boiled” eggs for us on the weekends! The yellows would just be so smooth and thicker than the white with an incredible rich taste. Ah! The props with your photos are superb! This would be a great bed and breakfast shot! 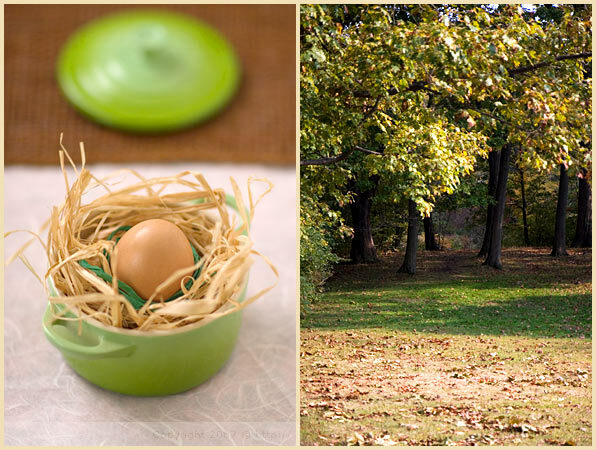 I’m not sure which I like better: the gorgeous eggs or the beautifull fall colors! 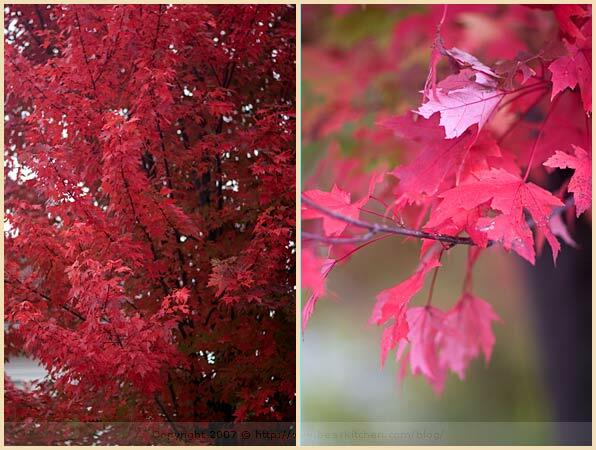 I do miss the colors, living here in France…No maples! 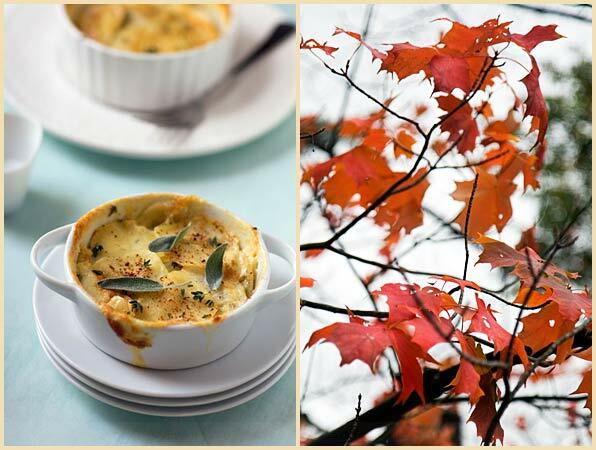 Lovely autumn photos. In summer, I love eggs softly set inside a hollowed-out tomato. As for the colder months, I did see a glossy magazine last year with little wool touques (caps) knitted for the eggs. Pretty egg pictures. These are called coddled eggs in English. 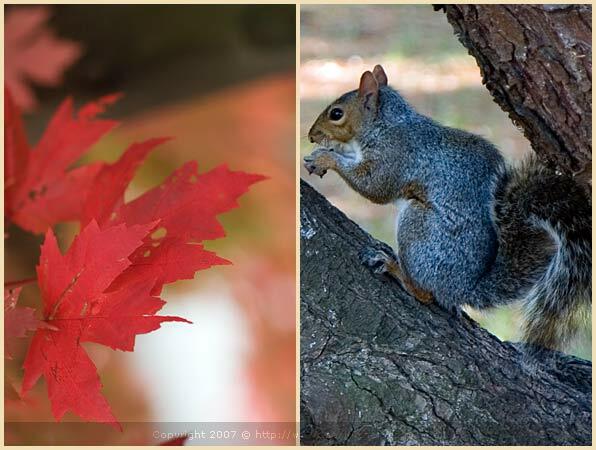 Ah, your pictures make me really miss autumn in New England – such beautiful shocks of colors, and I’m addicted to that shade of leafy red. Lovely looking eggs in cocotte, too. Tes belles images d’automne ne me font pas regretter l’été… même si chez moi, le froid s’est installé un peu rudement ! alors un petit oeuf cocotte c’est l’idéal ! I adore oeufs en cocotte, and yours look as beautiful as they must taste. Your photos are pure eye candy! It’s amazing how much you can make with eggs — and it can look so complicated although it really isn’t. On the other hand, this little ingredient can really mess folks up. I heard somewhere that one of the famous New York chefs had potential cooks make an omelet — and far to many can’t pull it off. And the fall colors! Aren’t they amazing? We get them here in Ohio, too, although New England is supposed to be the emperor among them all. This year, though …. I don’t know. So warm. Some trees are already bare, others are green. Strange. It doesn’t matter what it’s called…this is a wonderful way to cook eggs. I love runny yolks too…just last night I had a poached egg on soup so the rich yolk could be broken into the broth. I’m saving your recipe because I don’t have a version of baked eggs that I really love…can’t wait to try it! I love runny eggs as much as I love your photos! The trees look soooo beautiful! 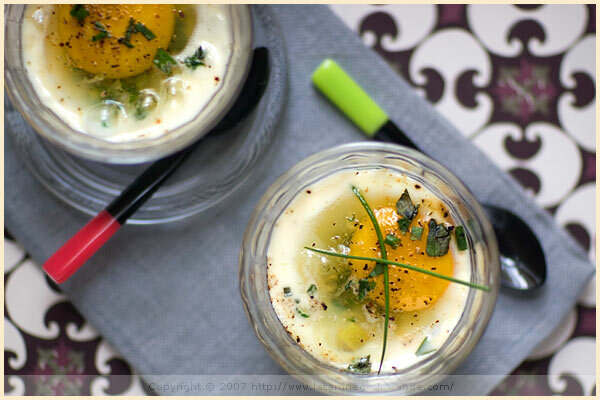 I love oeufs en cocotte, and these look delicious! 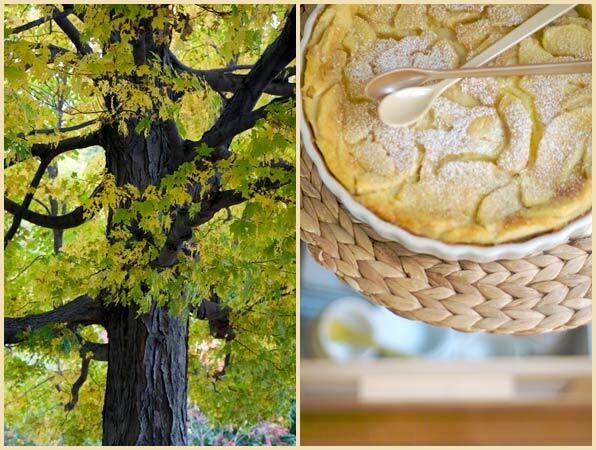 And that apple flognarde…. I await your next post! Just beautiful! Who hates runny eggs? They are magnificent! I HEART runny eggs!!! What an amazing post. Graphisme, simplicité, esthétisme.. Je suis FAN !!! Tu es fantastique! J’adore ton blog e tes photos!! A beautiful post. I love a runny egg and I can’t imagine anyone not liking it after this post! Inspiring work! Thank you very much everyone! Merci beaucoup ! Tes photos sont superbes ! c’est un menu tout à fait pour moi ça ! I loved your beautiful pictures. I was actually looking for Les Verrines, but ending up copying your recipe for Eggs en Cocotte. Thank you for posting. Your photographs are very beautiful. 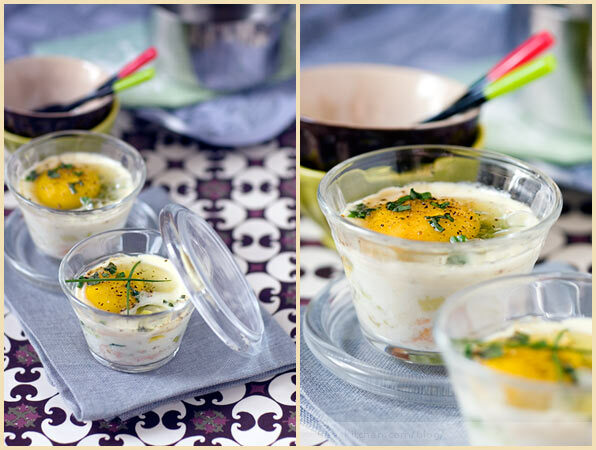 I recently had oeufs en cocotte avec saumon in France and was delighted to find your recipe. Thank you.